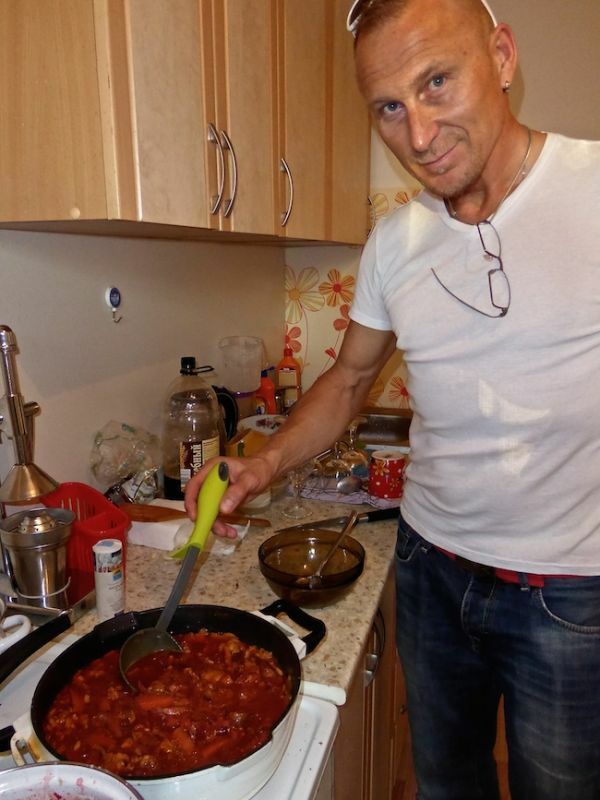 On one of our stop overs from our Trans Siberian adventures in Irkutsk, we met up with our good friend Ivan, who taught us this very tasty recipe for the famous Russian soup – Borscht. Borscht is a very popular light soup in Russia, Ukraine and prevalent across most of Eastern Europe. Beetroot is usually the main ingredient used. Borscht can be eaten as a meal in itself or as a starter, usually served with rye bread. This recipe is for a Borscht soup to be eaten as a main course and served around 10 people. As is common with most soups – the trick to getting a tastier and richer flavour is the length of time the broth is made. The longer the broth takes to make, the better. The longer this takes, the better. The tastiest broths will ideally take several days of cooking. However, more realistically, and practically, this is likely to be a few hours (or you can buy ready made broth from the supermarket and compromise on flavour). 1. Place the meat in a large saucepan and cover it with waters and add the bay leaves. Cook for 2-3 hours (or longer) with the pan covered and on a medium heat. 3. After a few hours the meat will start to come apart from the skin. When this happens, separate the meat from the bone and disregard the bone. 4. Once finished, strain the broth and keep the meat in separate container. Chop the meat into smaller pieces. At this point you can start preparing the beetroot mixture (point 9-13 below) at the same time. 5. 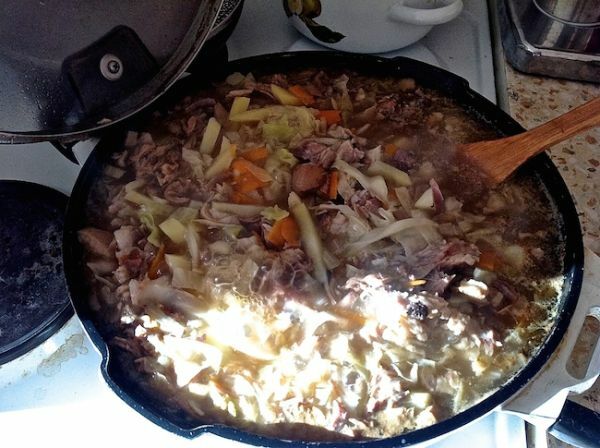 Place the broth mixture in a saucepan and add the chopped cabbage. Boil this for around 20 minutes, on a low heat, the pan covered, until it starts to soften. 6. Add x1 chopped carrot and continue cooking the mixture for around 20 minutes, the pan covered, on a low heat, until the carrots start to soften. 7. Add the sliced potatoes to the mixture and cook the mixture, the pan covered (on a low heat) until the potatoes start to soften (around 20 minutes). 9. Sauteed the chopped onions – cook them on a low heat with oil, covered (on a low/medium heat) for around 10-15 minutes until they start to change colour. 10. Add x1 sliced carrot and cook it (on a low heat, the pan covered) with the onion until it starts to change colour. 11. Add the sliced beetroot and continue cooking (on a low heat, the pan covered) until they soften. 12. Once the beetroot has softened, add the chopped tomatoes and continue cooking for a further 10 minutes. The tomatoes must be added at this late stage to avoid them hardening. 13. Finally, switch off the heat and mix in the lemon juice, chopped lard and garlic. 14. When the broth cabbage and potatoes are soft, add the beetroot mix to it. 15. Boil the mixture, on a medium heat, the pan covered, until the beetroot completely softens (around 30 minutes). Serve with vodka (!) and as with most Russian dishes, lots of chopped dill for added flavour. 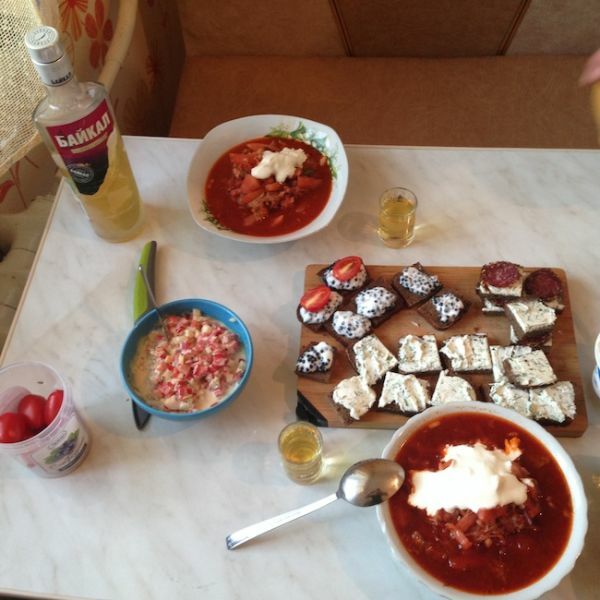 In addition, it is popular to serve “smetana” with Russian soups. Smetana is sour cream, similar to creme fraiche. Read more from our travels in Russia, including our article as to whether we think Russia is safe for gay travellers.